A Guantanamo case currently awaiting an appellate decision from the D.C. Circuit, Alsabri v. Obama, illustrates the difficulty of using captured documents as evidence. 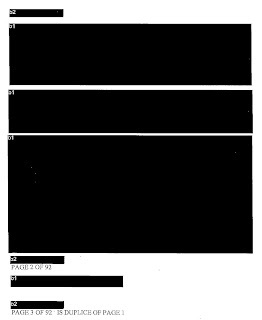 Thus far public analysis of the captured documents angle in the case, however, has been lacking for a very good reason: heavy redactions. The 92-page collection of captured documents referenced both in Judge Urbina's redacted February 2011 District Court opinion (denying Alsabri’s habeas petition) and in the parties’ redacted appellate briefs - appellant brief, appellee brief, appellant reply (thanks Lawfare) - is completely redacted in the government factual return publicly filed in 2009 (save for page numbers). 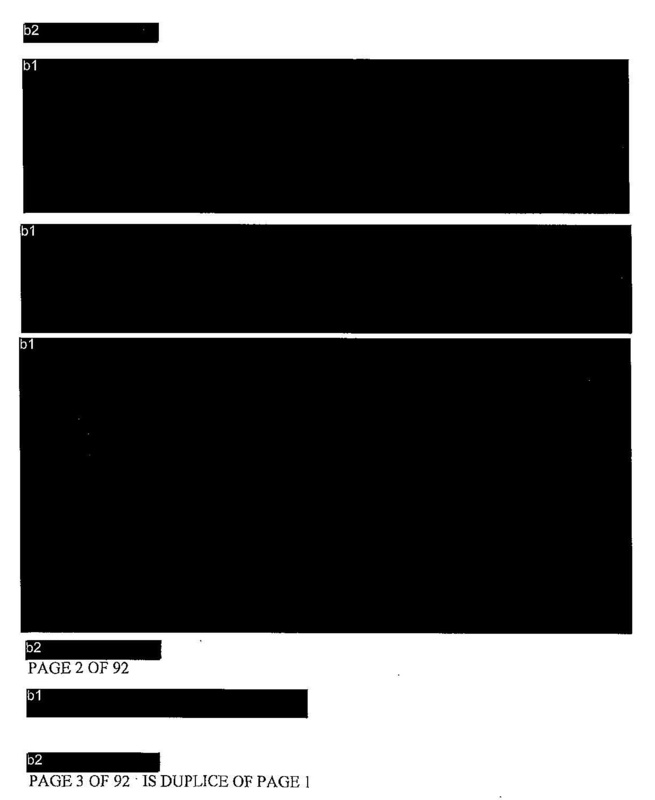 However, in another striking example of inconsistent redactions in GTMO filings, an almost completely unredacted version of the full 92-page collection - AFGP-2002-800321 - was filed in a different case (compare the 92-page redacted and unredacted filings for yourself). This allows one to fill in many redacted holes in the opinion and briefs. While there are many other issues and other evidence in the case that may determine the ultimate result (and giving the D.C. Circuit the benefit of the doubt that results in detainee habeas cases are not always inflexibly predetermined - see, e.g., Silberman's concurrence), the captured documents are a uniquely central issue in the litigation. In the end, Judge Urbina held that there was “substantial evidence” of the “authenticity and reliability” of the AFGP Documents and that “[t]hese internal al-Qaida records indicate that after applying to attend an al-Qaida training camp, [Alsabri] did, in fact, receive such training.” Based, in part, on this evidence, Judge Urbina denied Alsabri’s habeas petition. Al-Sabri appealed. An evaluation of Judge Urbina’s treatment of the captured documents becomes more interesting when the details on which the government relies are fleshed out in the appellate filings and in the unredacted version of the documents. Three pages are at issue. 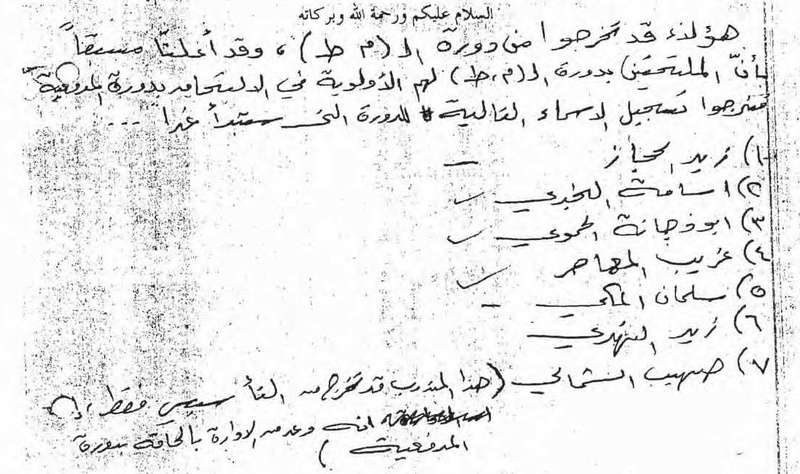 The government argues that this name (meaning “Father of Salman from Mecca”) was an alias for Alsabri (who was born in Mecca) and Judge Urbina found, in reliance on the DIA’s characterization of the documents as training records, that Alsabri’s purported appearance on this list suggested that he “sought out and received training from al-Qaida or the Taliban.” Alsabri argues on appeal, however, that Judge Urbina made an erroneous and “severely prejudicial” assumption about the context of page 52 that exceeds even the government's own allegations. 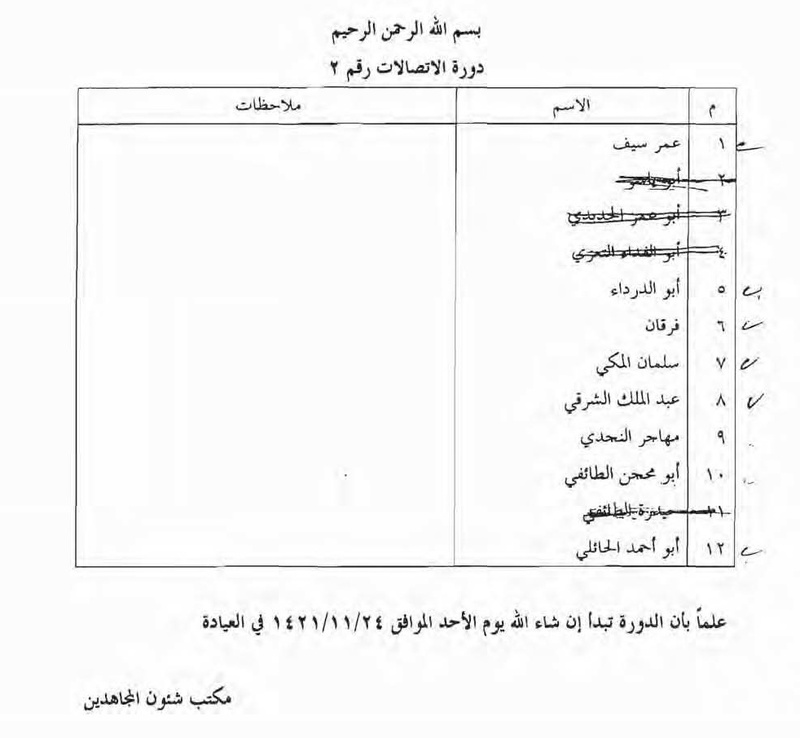 In particular, Alsabri argues that nothing indicates that the “arriving brothers” are arriving to a training camp and that, in fact, the government had never even alleged that Alsabri was at a training camp “on or around” the arrival date listed on page 52 (when converted to a Gregorian date) for "Abu Salman Al-Mecci." Judge Urbina's possibly erroneous assumption about page 52 illustrates the crucial importance in evaluating captured documents of detailed contextual information of the type Judge Urbina was willing to live without. A general statement in a DIA record that the documents are training camp records, for example, overlooks the complexity of examining how different pages and documents within the larger collection may, or may not, relate to one another. Alsabri’s lawyers, for example, characterized the 92 pages as “disparate” and a “hodgepodge of materials” for which you can find some support by paging through the translations. What is particularly interesting is the lack of any indication in Judge Urbina’s opinion or in the appellate briefs that copies of the original Arabic documents were scrutinized in the case. There is also no indication in the public factual return from 2009 that the government even filed them in the case. Luckily, copies of the Arabic originals were filed in other another case here. Why are the originals important? For one thing, they are a source of additional information on the relationship, or lack thereof, of the 92 pages to one another. In the originals, for example, the “hodgepodge” nature of the pages is even more apparent: some pages are typed, computer generated documents; others are handwritten notes, etc. Compare, for example, the first two pages. 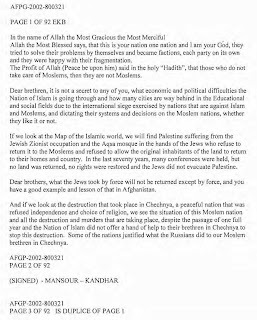 In the translation you would get the sense that the first page is a letter that is from Mansour in Kandahar who "(signed)" it on page 2. 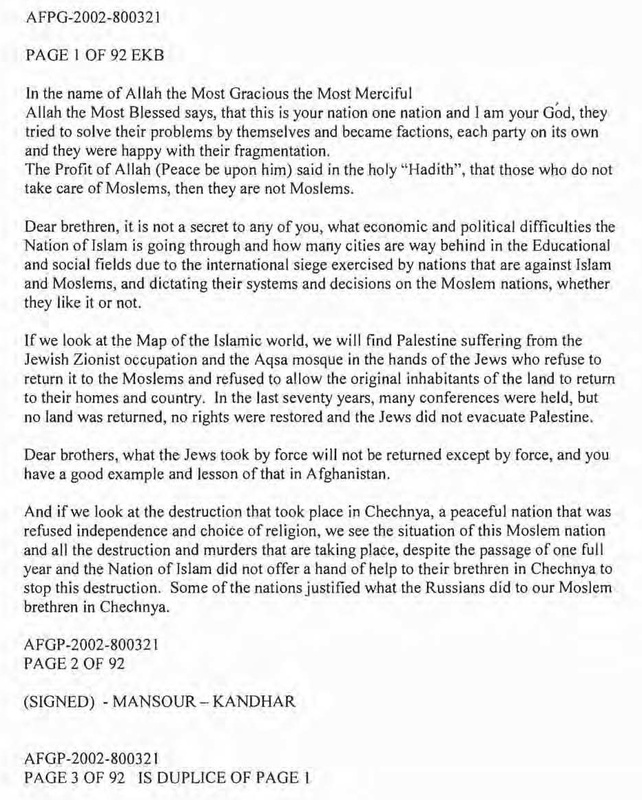 Now look at the first two pages in the original - not only is there more than "Mansour" and "Kandahar" written on page 2, but it also doesn't give me the impression that page 2 is actually a signature for page 1, if it is related at all - you can judge for yourself. Such factors further invite questions that even the belatedly-admitted DIA record were apparently unable to answer: Were these documents found in the same file, the same drawer, the same room, the same building, were they documents from several different raids on the same night, same week, same operation, etc? For an instructive account of the reality of capturing documents and preserving context in Afghanistan at the time, see retired Marine Major Vernie Liebel’s Paper and COIN: Exploiting the Enemy’s Documents (describing the aftermath of a raid in Afghanistan in which “a third of the media, mainly loose papers and books, was blown away by high winds or burned by the troops to keep warm”). The government did, however, assert that Alsabri attended training camps based on pages 34 and 84 of the captured documents. On page 34 there is a list of names under the title “Communication Class #2” and listed at #7 is “Salman Al Makki” (note no "Abu"). the names that comprise his alleged kunya - "Salman" (meaning "peaceful") and "al-Makki" ("from Mecca") - are extremely common - essentially, the Arabic equivalent of "Bob, from New York." And because the names are so common, one cannot conclude that the names on pages 34 and 84 - [REDACTED] - refer to Petitioner. Analyst Note: Detainee is noted as Salman al-Malky on page 84. 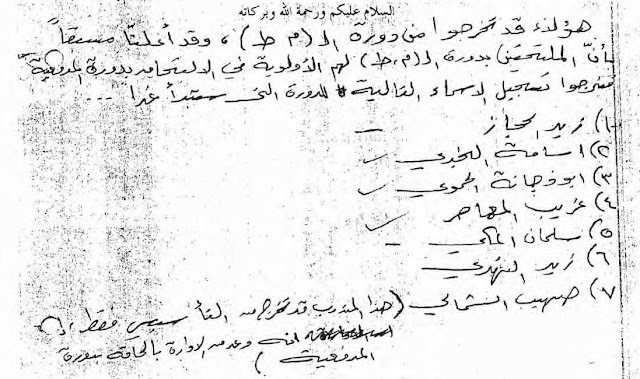 A review of the original letter in Arabic shows that al-Malky was incorrectly transliterated and the actual name is Salman al-Makki, detainee's alias. Second, if you consult page 84 in the original Arabic, you also see that there are notations - check marks - next to some of the names and not others (including Salman #5). 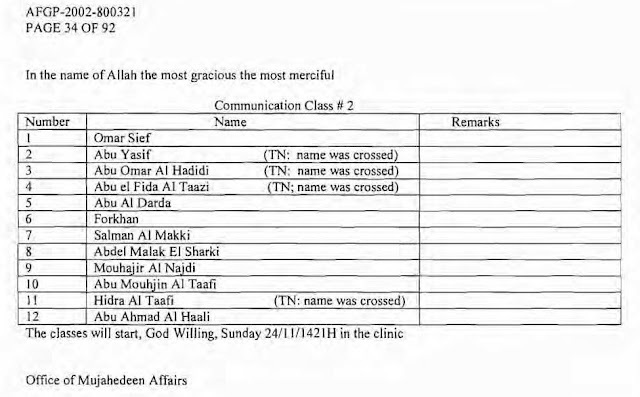 Could these check marks potentially indicate that these individuals did, or did not, actually receive the training referenced? It is unclear, but analysis that relies upon the translation alone would not even ask such a question. Similarly, the original page 34 also contains notations. Some are noted in the translation (for the names scribbled out, there is a Translator Comment that "name was crossed") but others, such as more check marks of uncertain significance, are not indicated. It is unclear what, if anything, the D.C. Circuit might make of these issues. Given its recent decision in Latif, however, which mandates that the District Court afford a presumption of regularity to government records (in this case potentially both the DIA record and the translation) it is possible the D.C. Circuit might scold Judge Urbina for too much, rather than too little, scrutiny of the captured documents. We will wait and see.